Since I began working at Ethos Magazine in 2013, I have strived to find untold stories in the Eugene community. This award-winning student publication focuses on multicultural feature articles. As an associate editor, I have managed story groups, pitched ideas, and edited stories. My own written work has been published in the print and online editions of Ethos. "I never told my parents. The nightmares kept coming back, though it was difficult to distinguish between the dream state and reality. Bedtime was a chore, and not something that I looked forward to as an opportunity for rest. Keep in mind: I was only 8 years old at the height of my episodes. They were horrifying." "It is easy to forget that a human calls Lane County Ferret Shelter and Rescue her home. The smell indicates that ferrets run the show, absent of the air freshening fragrance typical of an American home. But as the shelter’s owner, Ellis doesn’t mind." "Hunter, like others concerned about wireless technology, limits her exposure to wireless devices in hopes that she will be less vulnerable to future health problems. Her computer is hardwired, devoid of Wi-Fi. None of her devices are on when she sleeps." "Trust has been our biggest obstacle since I was assigned to her as a guide dog two years ago. But every day, we get a little closer, balancing friendship and partnership 24/7." "It has been a little over a year since the group formed, but one thing has remained the same since day one: Mellow Yellow’s authenticity allows them to capture the hearts of their dedicated Eugene fans." "Talking to Joe, it was easy to see why people think he is so funny. He seemed relatable, easy-going, relaxed, and confident in his answers. Nothing seemed rehearsed, and even though much of stand-up comedy is rehearsed, his personality is what really sets him apart." "The coach claps, yells, and encourages the athletes as the timer nears zero. “One more rep!” A buzzer sounds, and the group exhales in satisfaction and breathes deeply to recover for the next exercise. Welcome to Eugene CrossFit." 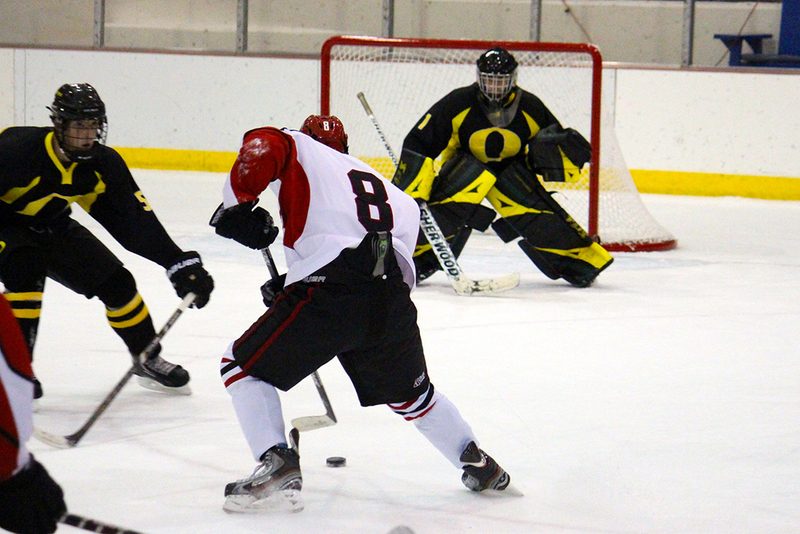 "A season after a second place finish in the PAC-8, Oregon Hockey renewed their pursuit of a championship with a recent home stand against Utah and Washington State."